Elementary Faith Formation classes are held from September – April. The first class will be September 11, 2018. There is one universal registration form for all the elementary age programs and one medical release form. Please fill out the form completely. Click the registration form link to print out the forms. Registration fee is $35/child or $70/family. Catechesis of the Good Sheperd is a program where children learn about the Catholic faith, the Bible and the Mass by working with hands-on material that are specifically made for each lesson. Each child works with materials designed for his/her age level. Tuesday evenings, 6:15 p.m – 7:30 p.m.
Pflaum Gospel Weeklies Faith Formation Program is a unique program that combines a complete doctrinal catechesis with the liturgical life of the Church. The individual “lesson by lesson” format provides each child with a fresh new lesson every week. The lessons correspond to the three liturgical years and include current events and cultural developments that help children see the relevance of the Gospel to their lives. New this year: 1)Family Connection on all levels with the same question of the week and family prayer so families can discuss and pray together each week. 2)Catholic Identity emphasis helps children appreciate the importance and beauty of being Catholic. Classes for the Sacraments of Initiation (Confirmation and First Holy Eucharist) and Reconciliaition are family based. 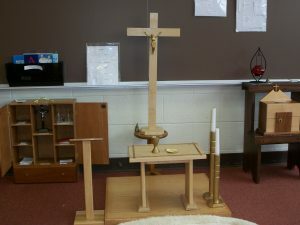 The preparation for these three sacraments normally takes place in the second grade. The child must have attended at least one year of faith formation classes before starting the sacramental classes. At least one parent or designated adult must attend each class. Classes are held on Tuesday evenings from 6:15 p.m. – 7:30 p.m. Use the Elementary Age Faith Formation Registration forms to register. Youth Ministry gatherings are held on designated Sunday evenings (6:00 p.m. – 7:30 p.m.). Dates will be published soon. Sunday sessions will help the youth discover who they are becoming in Christ. There is time for fellowship, food, friends, as well as faith formation. All Jr. High and High School youth are invited to come. The youth will help plan service projects and outreach opportunities along with fun social events. No registration fee for youth ministry gatherings, there may be a fee for special events. A Medical Release form is required for all youth who attend any event.